The Res Publica, the group I am working for here in New York just launched a new campaign today urging the US to open direct talks with Iran about its nuclear program. If you get a chance, please take a look and make your voice heard. The last thing the world needs is a global nuclear arms race, so let’s seize this moment to show the Bush Administration that the world has a stake in resolving things with Iran peacefully – and will hold him accountable. 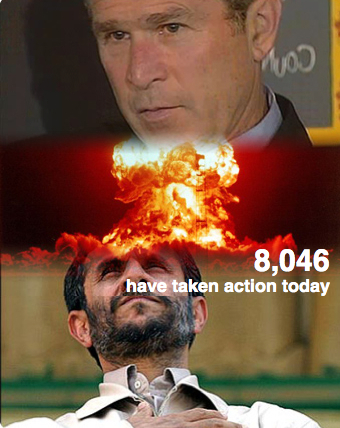 The Bush Administration is starting to learn that it ignores global public opinion at its peril. Let’s send a strong message to President Bush – forward this email to your friends and family, and encourage them to help prevent the nightmare of a new global nuclear arms race from becoming reality.